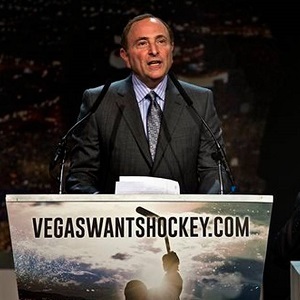 On December 8, 2014, following a meeting with the NHL’s board of governors, commissioner Gary Bettman announced that he would not object to Foley holding a season ticket drive to gauge interest in a Las Vegas team, indicating the possibility that the league may actually consider a Las Vegas team. However, Bettman also warned the media to “[not] make more out of this than it is.” During an interview with Hockey Night in Canada’s Elliotte Friedman aired on December 13, 2014, Foley revealed that Wayne Gretzky was acting as an “unofficial” advisor to the proposed team. On February 10, 2015, the season ticket drive began, with interested parties placing ten percent deposits on season tickets for a prospective team at the new arena by the 2016–17 season. 5,000 season ticket deposits were collected by Hockey Vision Las Vegas, an organization representing the Bill Foley and the Maloof families as owners of the potential franchise, bringing the ticket drive 50 percent of the way to the self-determined goal of 10,000 deposits. By April 2015, the drive had met its goal; Hockey Vision Las Vegas then began to solicit corporate and casino ticket sales to reach a supplemental goal of 13,000 total season ticket sales for the team’s inaugural season. On June 24, 2015, the league officially opened up the window for prospective owners to bid on expansion teams. By this point, Foley had secured more than 13,200 season-ticket deposits for the arena. Bettman expressed the league’s intrigue of expanding into such a non-traditional market, especially in the wake of Foley’s ticket drive, but warned that the NHL wanted to “take a deep dive and look at what there is in terms of the interest that’s being expressed.” On July 21, 2015, the NHL confirmed it had received an application for an expansion team from Bill Foley for a Las Vegas team; it was one of two bids to have been submitted, the other being a bid from Quebecor to revive the Quebec Nordiques at a new arena in Quebec City. 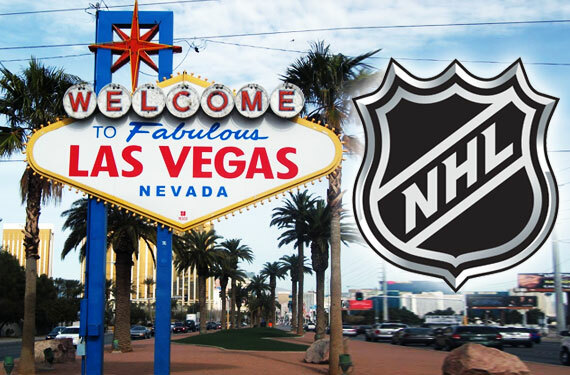 On August 5, 2015, the NHL announced it had invited both Las Vegas and Quebec to move into Phase II of the league expansion bid. The bid subsequently advanced to Phase III, which ended on September 4. 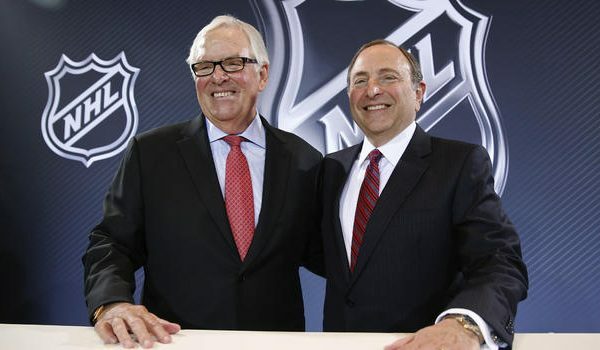 On September 29, Bill Foley and Quebecor met the NHL’s executive committee in New York City to present their respective bids. Bettman also said that expansion requires a three-quarters affirmative vote from the Board of Governors, but the members of the executive committee would first have to make a recommendation to the group, and that no deadline had been set for a final decision. Leading into the league owners’ meetings and the NHL Awards ceremony held on June 22, 2016, the Associated Press reported that Las Vegas had won an expansion bid and that terms for the 2017 NHL Expansion Draft were being finalized. 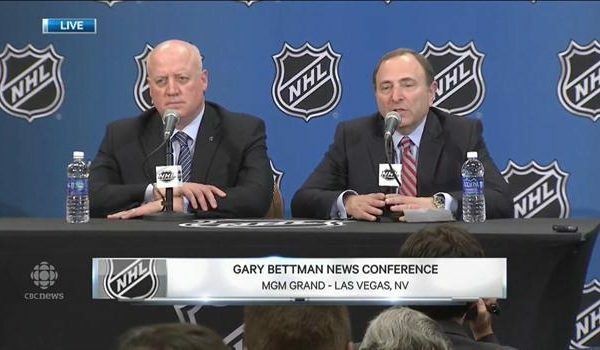 During a press conference later that day, Gary Bettman officially announced that the expansion franchise had been awarded to Las Vegas, and would begin play in the 2017–18 NHL season. It was the only expansion bid approved, with its Quebec rival “deferred” to a later date. The league also confirmed that an expansion draft would be held to populate the roster of the new team; Bettman stated that due to the larger number of players that would be potentially available to the team in comparison to that of the previous expansion draft in 2000, the team “will have a roster that will be competitive more quickly than prior expansions”. With the official approval of the Las Vegas expansion bid, Foley has committed to give $500 million to help fund the team and stated that the public would begin to “see a lot of action in the next 30 to 45 days”, as the team begins the process of hiring its principal staff (as assisted by Murray Craven) and determining its official identity, among other developments. Foley announced that former Washington Capitals general manager George McPhee would become the franchise’s GM. Foley has also begun the process of pursuing a regional television rights holder for the team, but has also considered starting a dedicated regional sports network for it. On August 2, 2016, Kelly McCrimmon, owner of the WHL’s Brandon Wheat Kings, was hired as team’s assistant general manager. The team is the first major professional sports franchise to be based in Las Vegas, and the first NHL expansion team since 2000. Foley’s original preferred name for the proposed team was the “Las Vegas Black Knights”—in tribute to the Army Black Knights, his alma mater. When he hired McPhee, Foley stated that he was working with the league to determine a suitable brand for the team, but that “it may not be until September that we have our name and logo. But when we do, that’s when we’ll have our big public celebration. We want to sell a lot of jerseys that day.” He also admitted that his preferred name of “Black Knights” was unlikely due to various legal issues with trademarks, copyrights and domain names. For instance, even if West Point officials gave their blessing to using the nickname, the federal government would have had the final say. He registered a number of trademarks for potential names, some based on “Knights” and others based on “Hawks” (the latter unlikely as it would likely clash with the Chicago Blackhawks), admitting some of the trademarks were deliberate decoys. On October 4, 2016, Foley announced that the team would be known as the Desert Knights, Silver Knights, or Golden Knights. He told Yahoo! Sports that his group already had “clearance on those names”, and made their final decision in late August. On November 22, 2016, the name was revealed as the Vegas Golden Knights, excluding ‘Las’ from the name. The team’s logo (as well as its secondary logo and word mark) was also revealed, incorporating a black V to represent Vegas. The Vegas Golden Knights are a professional ice hockey team that will be based in the Las Vegas metropolitan area. The team is scheduled to begin play in the 2017 – 2018 NHL season, and will be a member of the Pacific Division of the Western Conference of the National Hockey League (NHL). 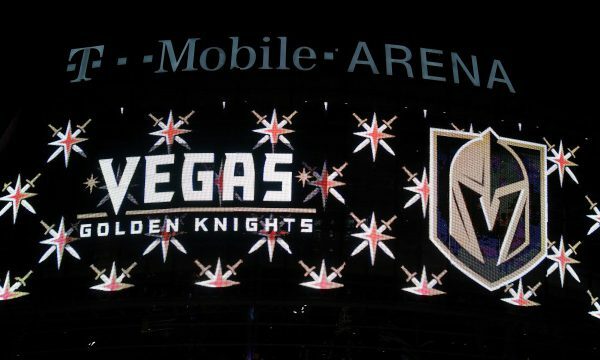 The team is owned by Black Knight Sports & Entertainment, a consortium led by Bill Foley, and will play its home games at T-Mobile Arena on the Las Vegas Strip in Paradise, Nevada. Golden Knights – Foley’s original preferred name for the proposed team was the “Las Vegas Black Knights”—named in tribute to the Army Black Knights, his alma mater. On November 22, 2016 the name was revealed as the Vegas Golden Knights, excluding the word Las from the name. Who is the greatest Vegas Golden Knights? The Vegas Golden Knights are a professional ice hockey team that will be based in the Las Vegas metropolitan area.